Getting more value from clamp silage requires a well built and consolidated pit. 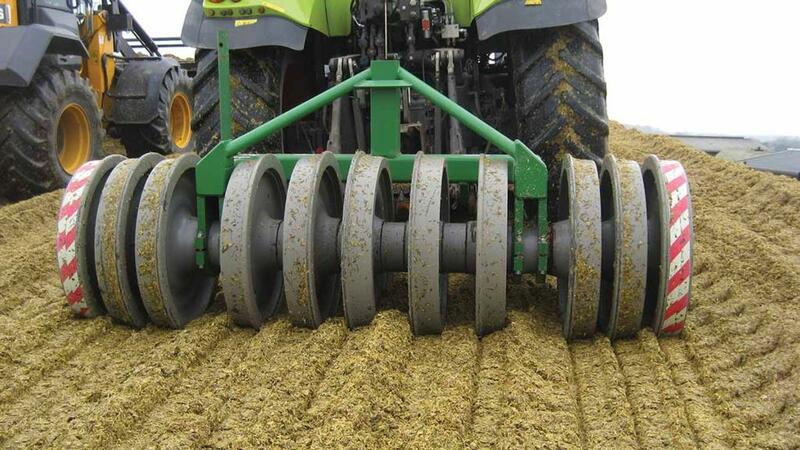 Jane Carley takes a look at a clutch of rolling implements to help with clamp construction. Clamp consolidation is key when it comes to making quality silage, and to aid this there are several manufacturers offering rolling solutions. WM Agri offers a range of clamp machinery from Dutch manufacturer Holaras. Stego rollers are designed to consolidate the clamp. The smallest is the Stego-Pro 200 which is two metres wide and said to be ideal for smaller contractors or dairy farmers who have a much tighter set-up with regards to clamps and buildings. 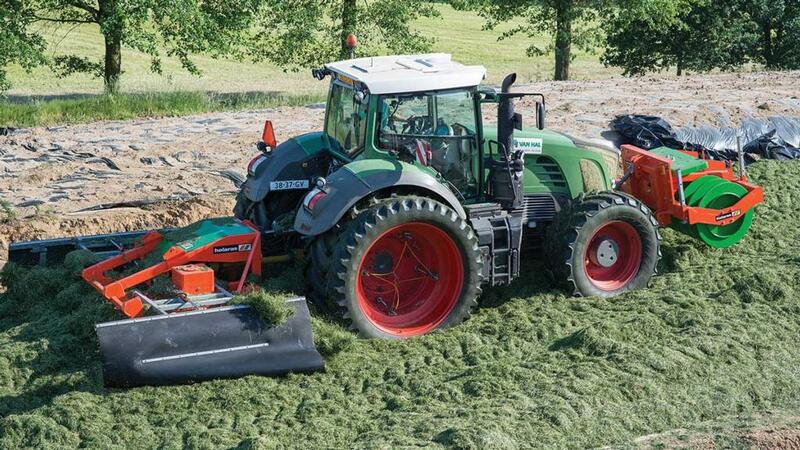 It is also available with a hydraulic side shift function which enables the operator to run half a metre from the silage clamp walls, making it much safer for the driver. It is priced at £6,500 with optional hydraulic side shift costing £2,650 and LED rear lighting adding a further £600. WM Agri’s founder Will Mallon says: “The Stego-Pro can also be specified with optional ballast weights, up to a maximum of three, available from Holaras at £340 per 300kg slice. We also offer our own 500kg ballast weight at a cost of £600. Fully weighted up the Stego-Pro 200 totals about 2.4 tonnes. The most popular model in the UK is the Stego-Pro 285, which also comes with optional hydraulic side shift and weight block. As standard, it costs £7,500. Essentially a 284 with 2.1m-wide side hydraulic folding rollers, the larger Stego-Pro 485 is also available, featuring a much beefier build to allow for the extra weight. It is priced at £17,250. 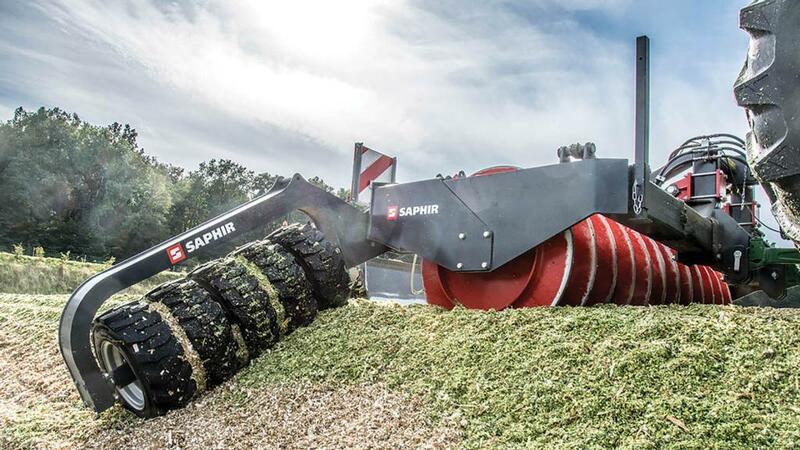 Saphir silage products are distributed in the UK by Suffolk Farm Machinery, with its SW 30 silage roller using welded rings to give a high point load and optimum penetration of silage. The set of 12 welded rings are spaced at 225mm with an overall working width of three metres. The roller body can be ballasted to a weight of 3.3 tonnes. A hydraulic offset of 600mm can be specified to keep the tractor away from the clamp edges. The SW 309-H variant has a wheel packer frame to consolidate clamp edges on free-standing clamps and 700mm of right-hand offset. This adds a further 400kg to the weight. While the SW 30 on its own would only require 130hp, Suffolk Farm Machinery’s Richard Carr says it is usually fitted to the rear linkage of a tractor which has a silage blade to the front for a one-pass operation, allowing consolidation on the journey back down the clamp. In this configuration, a 250hp tractor is needed. The price is £8,630 for the standard SW 30 and £10,300 for the SW 30-H, with the wheel packer frame adding a further £2,990. Lights and warning signs can also be specified. The SilaPactor from Kelvin Cave is said to speed up the compaction process almost four-fold, saving time and fuel. It is suitable for silages above 25 per cent dry matter (DM). SilaPactor has been shown to increase dry matter density by up to 40 per cent when compared to conventional tractor rolling, says the manufacturer. A silage density of 180-200kg DM/cu.m is generally achieved using traditional compaction methods but, in some European countries where the SilaPactor’s performance has been monitored, densities of up to 320kg DM/cu.m are commonplace, says Kelvin Cave. The SilaPactor is designed to be three-point linkage mounted and the best-selling version is three metres wide and weighs in at 4,000kg with 11 individual steel roller rings. It is also available in 2.1, 2.6 and 4m models. Kelvin Cave says it is seeing increasing demand for both the 2.1m SilaPactor for smaller operations and the 4åm version for AD plants.